Christmas home. They don't take up a lot of space, they come in all shapes and sizes and lend a cozy air. This weekend, the first snow of the season fell. As a dedicated summer girl I am not usually thrilled at the sight of those flakes, winter is long around here. However, Santa was right, Christmas snow is magical and somehow it managed to lull even me into a state of holiday bliss. It was wonderful to watch it outside, while we were cuddled up tight by the light of the fire inside. To be honest the whole house had a festive glow, lit up like a...well, Christmas tree. It was decorated with lights in every room and just in time for today's holiday hop hosted by Barb from The Everyday Home. I just love how that works out. 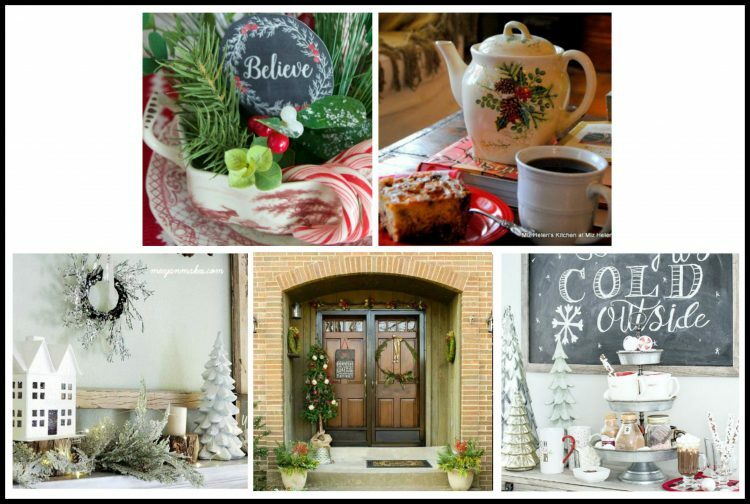 If you're visiting from Debbie of Refresh Restyle's fabulous farmhouse tour, welcome. I adore farmhouse style and I do try to incorporate little bits of it around my home, but truly, I live in a cottage. Built by the sea in the late 1920's, it's full of charm and great architectural features, but like most cottages, it's very, very short on space. 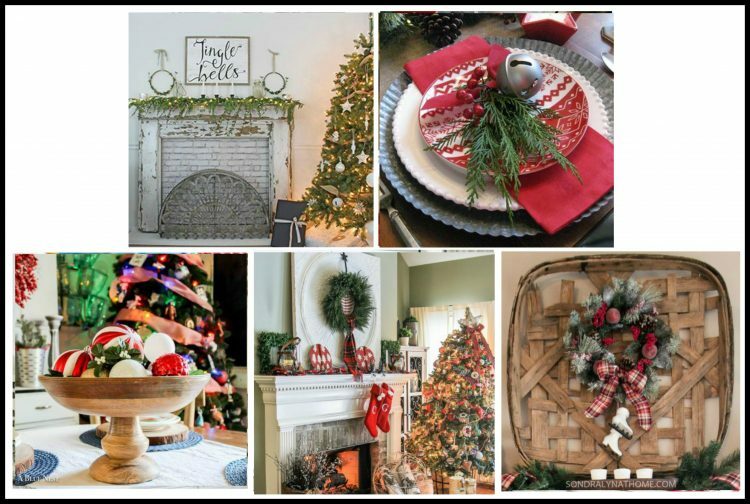 In the past, I filled every open area with Christmas decor, but for last several years, I have been cutting back, opting for a simplified season. I put out only what makes me smile and this year, it's all about the lights. They fill the rooms with holiday sparkle and a cozy air. Plus, they come in all sorts of fun shapes and sizes and best of all, they make the house feel festive without cluttering it up. Last week, I shared my family room. The main element? Lights. String lights to be exact. I used to try to hide the wires, tucking them into garlands, but I got tired of the heavy faux evergreens. They'd get dusty or fall down. They were bulky to store and they always needed some kind of sprucing when I pulled them out the bin each year. Now, I just loop the strands up and over the windows. I've been doing it for years and their simple presence instantly transforms the room. While their glow dominates, there are other illuminated accents. A ceramic church, a small naked tree and a single electric candle round out the room. There's not a Santa in the space, but there's no doubt it's Christmas. My kitchen is right next door. The decor is exactly the same in here ~ string lights, naked tree, electric candle light. It's like my mom used to say, if it ain't broke, don't fix it. There actually are a few Santas in this room, but again, even on my pine server, it's all about the lights. A little tree...more candles. The living room is where the big tree resides. It's lit from morning until night with tons of dainty white bulbs. ...and on my Christmas mantle, tapers sit next to a gift bag wooden sign and sock angel doll. My favorite lights are new this year, red paper lantern stars. They were in a clearance bin for less than two bucks, I grabbed them and popped battery operated LED light strands inside. 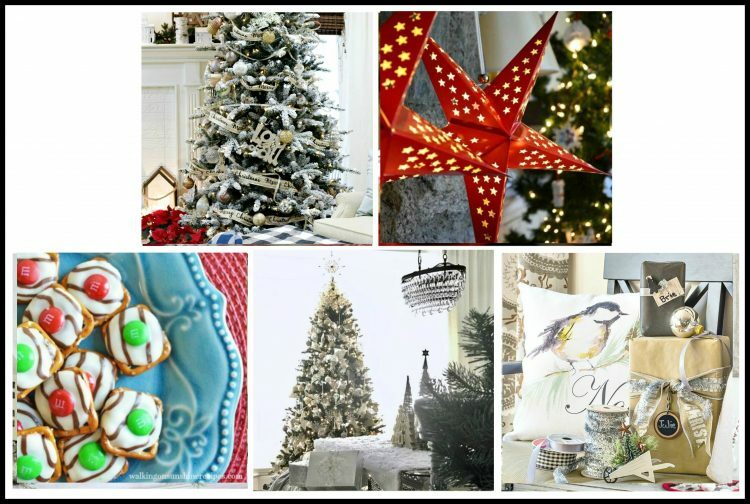 They are super fun and add an extra glow to my sweet Christmas cottage living room. In an ironic twist, as I was writing this post today, I realized that my tree wasn't quite as sparkly as it was yesterday. Upon closer inspection, I discovered that not one, but two entire strands had burnt out. So even though I had already decorated the tree once this year, today, I got to decorate it again. And now, we hop! Next up, Walking On Sunshine. You must check out her gift tags! We may be a lot later getting our Christmas decor out than some others - but you know how the ole' saying goes, "It's Better Late Than Never." 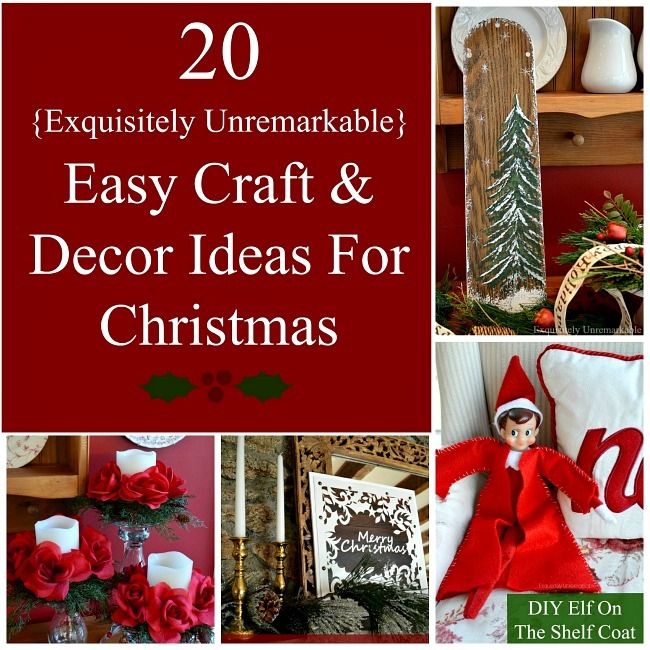 Please make sure you visit all of these amazing blogs for some last minute decorating ideas. It's very bright in here, Susie, that's for sure! Thanks for hopping by to day and for the super sweet words. Enjoy the holidays! Oh Kim, your home is so warm and inviting. I would love to tour it any time of year. 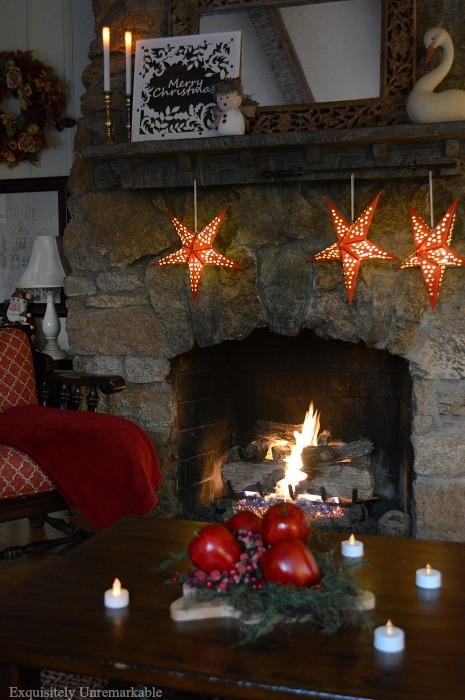 What a great idea keeping it simple with lights to add a festive glow and those red stars are perfect on your gorgeous hearth. Merry Christmas! Patti, thank you so much for your super kind words. You are welcome to pop by anytime! And I like those red stars, too...the color was just right! Merry Christmas! I'm with you. Other than our fireplace mantel, I keep mostly lights around the house. They lift the spirits on cold, snowy days when the temperatures outdoors can be too much to bear. Your lights are what I enjoy the most....simple white lights that make the house sparkle. Thanks for sharing! Thanks so much! And I agree Pepper…winter is dark and long around here and the lights change the feeling of the night. Some years, I have kept the ones in the kitchen up until March! Shhh…Merry Christmas! Kim, I was watching a Hallmark movie last night--what else! And the rooms in the house of the main male character was so pretty and I realized why--because he had lights everywhere, not just on the tree. So between that and your photos here you can bet I'm going to take the hint because I love it! Thanks, sweet lady! I love the lights on the valances. Let there be light!!!!! I love how pretty it makes all your rooms. 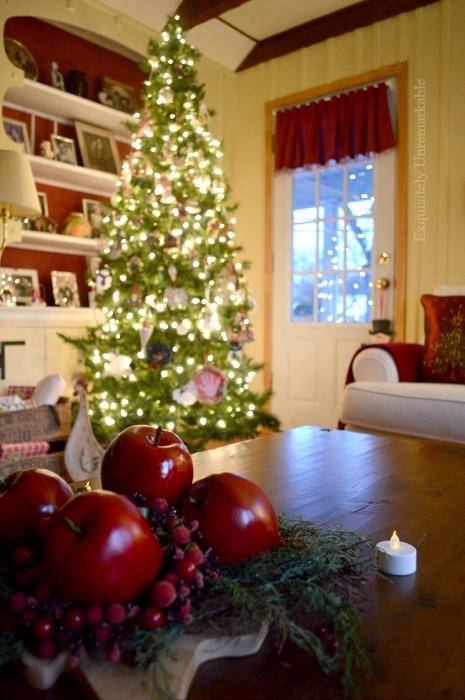 Your house looks so cozy and pretty for the holidays. Kim, lights certainly do bring magic to our homes for the Christmas season! 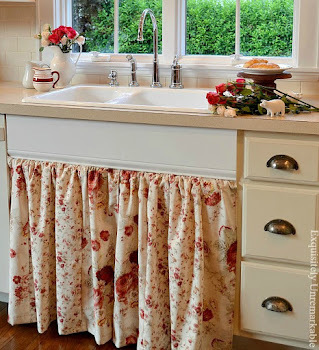 I've never thought of draping them on my curtains, but I love the look! The stars are awesome! Thanks Jann! I needed light after daylight savings kicked in, so I made my own...on the windows! I started it several years ago and now I'm addicted! Kim, it is no secret that I think your cottage is exquisitely REmarkable at any time of year, but at Christmas there are no words. Such a simple thing as draping a naked string of lights over the windows is beauty beyond compare. Your home truly shines with the love and talent you put into it..Merry Christmas! !xxoJudy P.S. I have one of those stars that I have never used and one little scrawny battery light string. Guess who will be copying (if I can find the star)..? Lights transform any space! I love them! 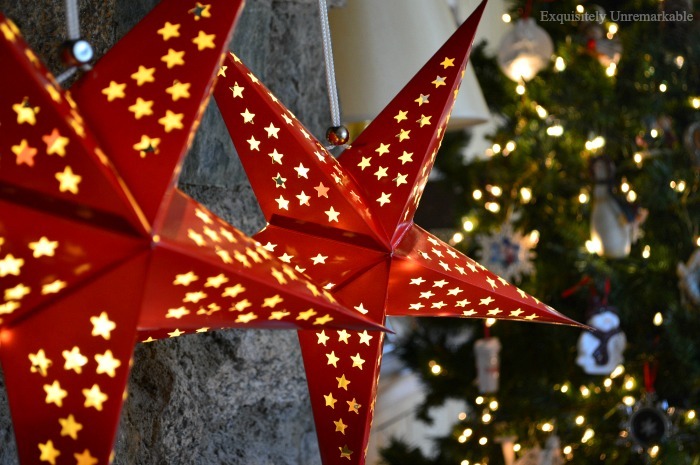 What a great idea to pop lights into those red paper stars! Thanks Deanna! I have to say I do love them lit up!! I've tried to streamline my decorating as well but looking around my house I think I still have too much. Why is it so hard for me to stop? I add & tweak all the way through the new year! I just so love Christmas decorations, in moderation. Going with lights is such a good idea. And not using ornaments is another! I put up four trees at home but this year I only used ornaments on two of them. I also limited the ornaments to all white on one & all red or bird themed on the other. It made it so much easier & looks just gorgeous. Christmas is a wonderful time of year and since everything is temporary, I think it’s ok to go a little crazy with the decor!! At least that’s how I rationalize it all!! I like your naked tree idea. You are apparently right on trend, too. How pretty it all is! I think I'll be stringing lights over the curtains next year. It really highlights your breakfast area. 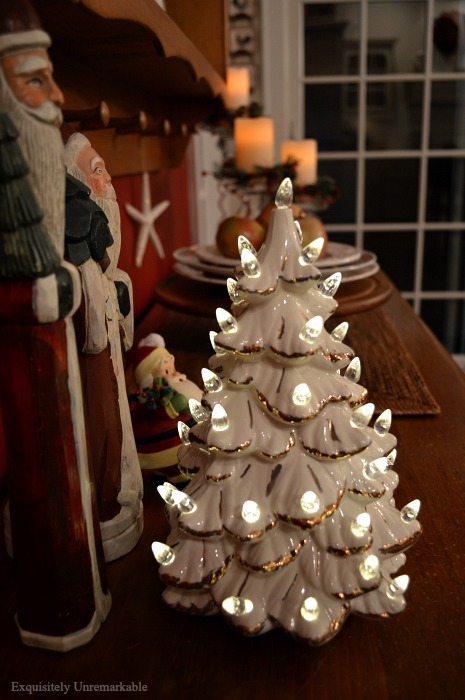 I am in love with your white ceramic tree. Please tell me it's new and where I can buy one, but I bet it's a treasured vintage piece. Hi Dawn! Thank you so much for the sweet comment about the lights! And I know you saw my post about the white thrift store tree. I hope you find one! 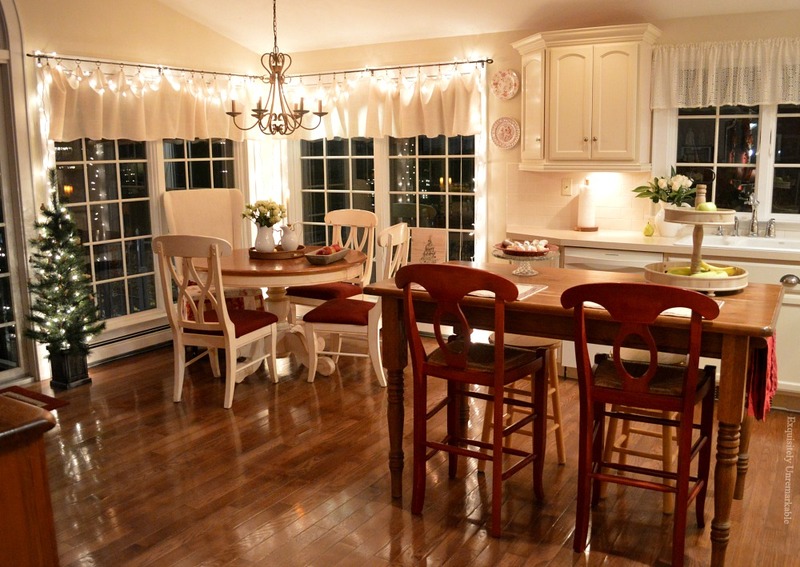 I love your cozy cottage and the lights are fantastic, you have inspired me to use more lights in my cottage. Your fireplace is so inviting, I could just cozy up right there and rest a bit. It is a joy to share the blog tour with you and thanks so much for sharing your lovely cottage. Thank you so much, Miz Helen! I am glad you enjoyed the tour and like the lights! I really appreciate the sweet comment and the visit! I love the idea of strings of lights around the windows. So pretty! I do love the white lights everywhere but for some reason all my lights this year are multicolored. It is quite nostalgic and cozy....like your sweet cottage! I go back and forth between white and multicolored lights. Some years I just crave that color! Beautiful! The lights do add a magical glow. I love your red paper stars! Thank you, Gina! I am a smitten with those paper stars, too! There's nothing like twinkling lights during the holidays. So pretty! Hi Kim, oh love your house and how pretty it looks with the white lights decorated throughout the house. You did a great job with it all. I hope you are staying warm and enjoy the holidays. Thank you so much, Julie! We are warm today thank goodness, but the snow has been here. And I think it’s coming back! I absolutely love the paper stars! Your house looks amazing! Thanks Lois! I have to say I really like them, too. I may keep them up for a long time! I LOVE your house so much, Kim!!!! And I know that you do also, I can see it in how well cared for it is, and can read it in your words!!! I think your house is one of my favorite blog houses, by far!! I love how your home is lite up. I'm always sad when my lights come down after Christmas...The paper stars are so pretty and you scored on them. Everything is so pretty! I’m sad when the lights come down, too, Cathy! I have to confess, sometimes, I leave them up until spring. Shhh…And thanks! Merry Christmas my friend!! I just love the little white tree. My new favorite and I must have one!!! 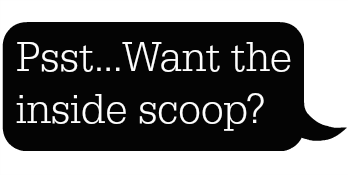 Can you share where you found it? Everything looks lovely, and like you, I have twinkle lights all over the house. Carla, you are so kind! I have to say I do love my fireplace and we don't use it enough. I love the winter and Christmas when we get in that room more often. And I know you saw my post about the white tree! I am loving all your lights! They make the season so magical. Thank you, Pamela! I really do think it’s that twinkle that makes the season! Merry Christmas! How beautiful, Kim! 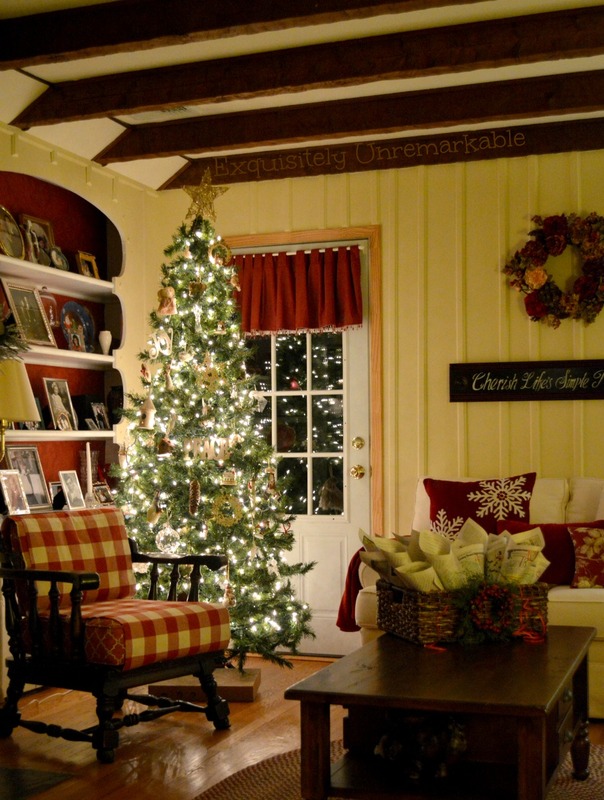 Your home looks so cozy and festive at the same time. Merry Christmas! Thank you so much, Maria. I wish you a wonderful light filled season as well. Merry Christmas! Loving all the pretty glowing lights too, they certainly add Christmas magic! Merry Christmas, Jemma! Enjoy that sweet family of yours! 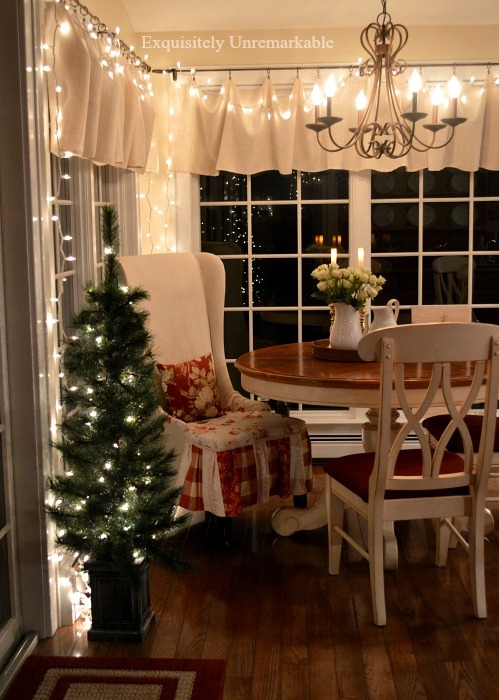 I even have one string of white lights that stay up in the kitchen all year....so there!! PS: smile for the day....in the ads here on your site, there was one for "Cottages in Con-can, Texas"...I have stayed in those very cabins, on a bird watch tour! It was GREAT!! Hi Kim, Your home is just so pretty with the glow of the lights. I really love how you have them strung over your window curtains. The scene is cozy and inviting for the holiday. Thank you for sharing and always inspiring!! Also thank you for taking the time to visit my once a month post and kind comment. What a lovely Christmas home, Kim. All of the lights certainly give off the Christmas spirit. Every room is beautiful with a touch of your style. Thanks for inspiring us. That you so much, Meegan! I do like those lights! I adore your cottage! It looks like something from a Hallmark movie!! 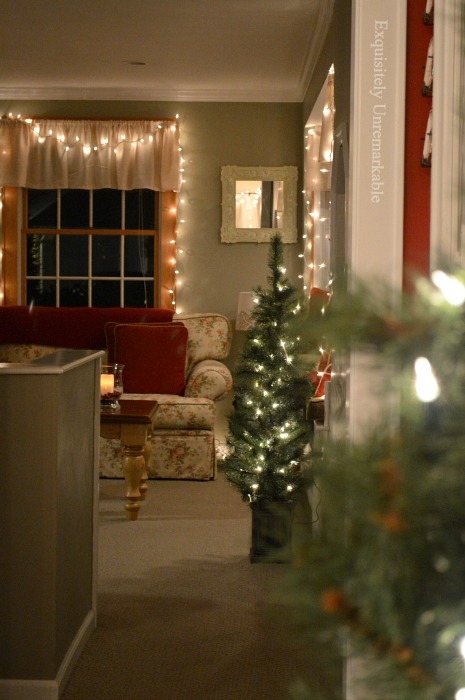 You really can't go wrong with twinkle lights! Jordan, you just made my day! What a lovely compliment. Thank you!! Simple is best, I'm with you, Su! Merry Christmas my friend. Enjoy! Beautiful Christmas decor. I particularly love the red paper lantern stars --so festive!